Donna is a Contemporary Artist based in London, England where she shares her time working as an Arts Psychotherapist and Artist. Donna came to London in her early twenties to do a Foundation in Art & Design and had every intention of entering the art world but curiosity and interest in the human psyche won through. She sidetracked into a career as an Arts Psychotherapist and after many years in the field of Psychotherapy she is now responding to the pull of the paint and art materials. The past few years have been spent becoming re acquainted with the painting process and falling in love with it all over again. Donna’s paintings reflect a curiosity and love for the natural world, open spaces, colour and light. She is heavily influenced by a childhood in the Caribbean where she was surrounded by lush tropical colour, turquoise seas and cultural diversity. This experience has instilled in Donna a strong sense of colour, light and unending curiosity about the world and it’s inhabitants. Her creative process involves exploring and experimenting with the art materials until she has a felt sense that the work is complete. She describes listening to the needs of the painting and can work on a piece over weeks or a day. Her trust in the creative process takes her where she needs to go and informs her of what materials to use. Donna works intuitively with a variety of art media from acrylic, water colour, ink, collage to digital work on the Ipad. She enjoys experimenting with new art materials, often pushing them to their limits with the intention of learning and developing further into her own creative style. 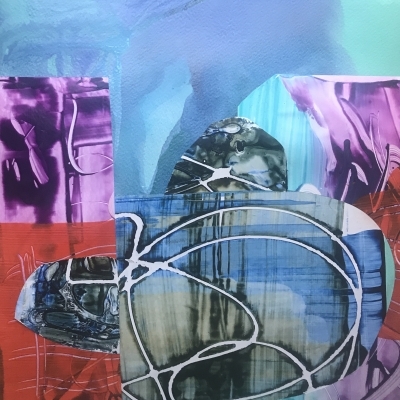 Donna is currently exploring a combination of collage, paint and mixed media on both paper and canvas to express her love of the sea and the organic coastline. It is this new work that she will be showing at Roys People Art Fair.